Six in ten seniors—59%—report using the internet. This is a six percentage point year-over-year increase from the 53% of older adults who went online at a similar point in 2012. 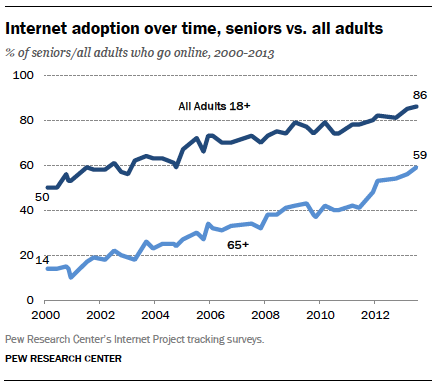 Five years ago in May 2008, just 35% of older adults were internet users. However, usage rates among seniors still trail the population as a whole by a substantial margin, as some 86% of all U.S. adults now go online. The story with broadband adoption is similar. Today 47% of seniors have a high-speed internet connection at home, up from the 39% of seniors with broadband in May 2012, but significantly below the current national broadband adoption rate of 70%. At the same time, broadband adoption among older adults has more than doubled over a five-year period: in May 2008 just 19% of seniors were broadband adopters. 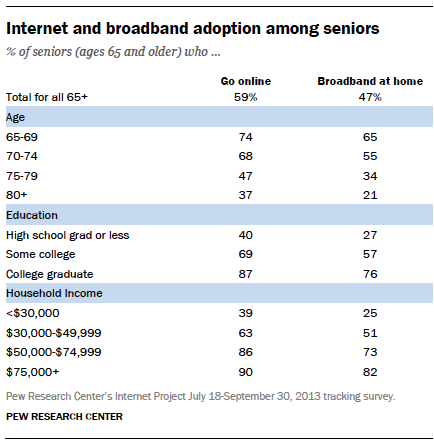 Those in their mid-to late-60s—74% of seniors in the 65-69 age group go online, and 65% have broadband at home. Higher-income seniors—Among seniors with an annual household income of $75,000 or more, fully 90% go online and 82% have broadband at home. College graduates—87% of seniors with a college degree go online, and 76% are broadband adopters. On the other hand, other subgroups of older adults—in particular, those 80 years of age or older, those with low household incomes, and those who have not attended college—tend to be much more removed from online life. For example, slightly more than one third of those 80 years of age or older (37%) use the internet, and just one in five members of this age group—21%—have a broadband connection at home. Overall adoption levels are similar among seniors who have not attended college, as well as among those with an annual household income of less than $30,000 per year. Fully 77% of seniors are now cell phone owners. This trails the national average—91% of all Americans own a cell phone—but represents a significant year-to-year increase over the 69% of seniors who owned a cell phone in April 2012. 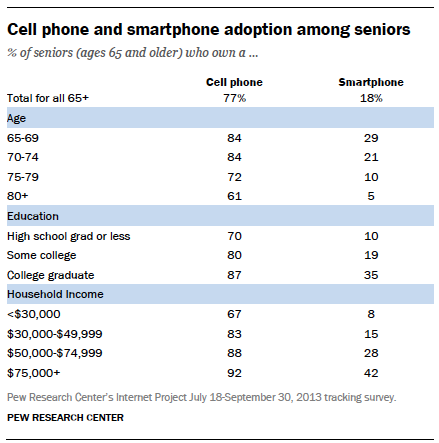 More notably, cell phones are now owned by a majority of seniors in every major demographic subcategory. Even among the oldest seniors (those 80 years of age or older, just 37% of whom use the internet), cell phone adoption sits at 61%. But even as cell phones are becoming more common among seniors, smartphones have yet to catch on with all but small pockets of the older adult population. Just 18% of seniors are smartphone adopters (this is well below the national adoption rate of 55%) and their rate of smartphone adoption has been growing at a relatively modest pace. Since the Pew Research Center first began tracking data on smartphone ownership in May 2011, smartphone adoption nationally has increased by 20 percentage points—from 35% to 55% of American adults—but adoption levels among seniors have increased by just seven percentage points, from 11% to 18%. Smartphone ownership is fairly low along the entire age spectrum of the older adult population, but decreases substantially for seniors in their mid-70s (10% of 75-79 year olds own a smartphone), and becomes nearly non-existent among seniors in their 80s and beyond (just 5% of those 80 and older are smartphone owners). Even the most affluent seniors (that is, those who live in a household with an annual income of $75,000 or more) have high levels of smartphone ownership by the standards of the older adult population but trail members of the general population at a similar income level. Some 42% of older adults at this income level are smartphone owners. This is more than double the rate among seniors as a whole, but roughly half the smartphone ownership rate among high-income adults within the general population, 76% of whom are smartphone adopters. 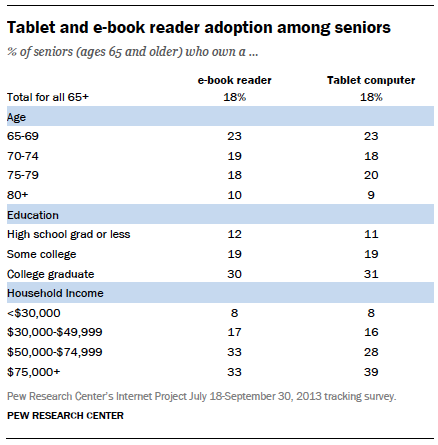 Some 18% of seniors own an e-book reader, and an identical 18% own a tablet computer. 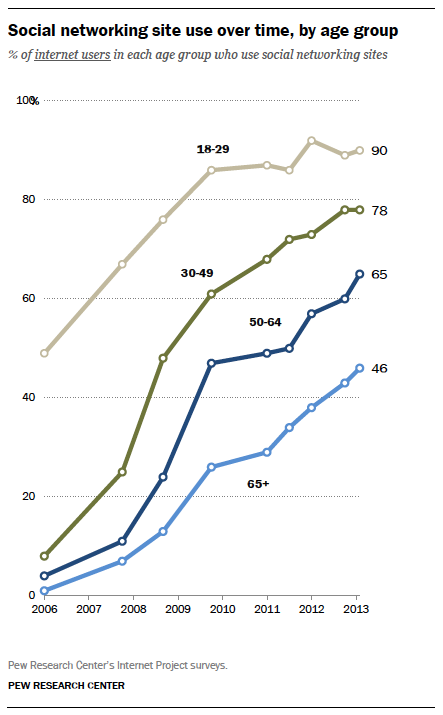 Taken together, 27% of older adults own a tablet, an e-book reader, or both. E-book reader ownership levels among seniors are slightly lower than the national average (24% of all U.S. adults are e-book reader owners), while tablet ownership levels among seniors are around half the national average (34% of all U.S. adults are tablet owners). Nationally, tablets and e-book readers are most popular among college graduates and higher-income Americans, and this is also true among seniors. Seniors who have graduated from college are around three times as likely to own both an e-book reader and a tablet as are seniors who have not attended college, and those with an annual household income of $75,000 or more per year are around four times as likely to own each device as are those with a household income of less than $30,000 per year. Usage of social networking sites by older Americans has been steadily increasing in recent years, but has not yet reached majority status—among older adults who use the internet, 46% use social networking sites such as Facebook, well below the national average of 73% of adult internet users. On a “total population” basis (that is, accounting for individuals who do not use the internet at all), 63% of all American adults, and 27% of all Americans ages 65 and older, are social networking site users. As is the case for the online population as a whole, older women are more likely than older men to use social networking sites. Half (52%) of female internet users ages 65+ are social networking site adopters, compared with 39% of older men. Social networking site usage is also more common among the younger cohort of seniors, and adoption drops off dramatically after age 80. Some 54% of internet users ages 65-69 use social networking sites, compared with just 27% of internet users ages 80 and older. Few older adults use Twitter—just 6% of online seniors report doing so, compared with 19% of all adult internet users. In total, that means that just 3% of all American seniors are Twitter users.